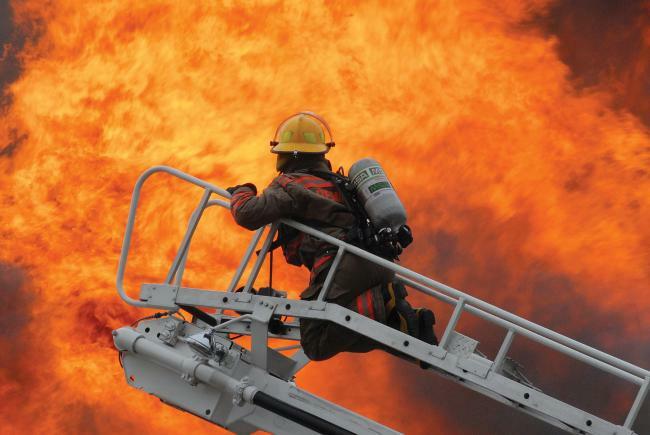 Ladder Trucks are recommended for fighting fires in buildings above 35 feet high. Marinwood Village is 46 feet high at the highest point according to Bridge Housing plans. Grady Ranch is 60 feet tall. 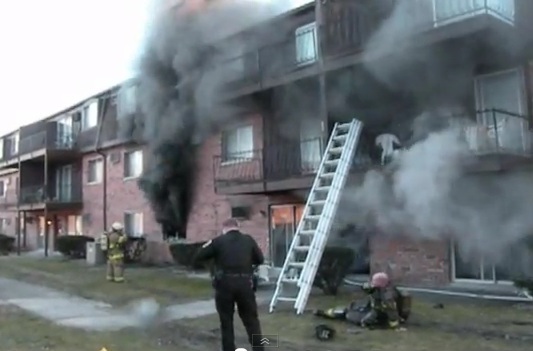 Ladder trucks can save lives. 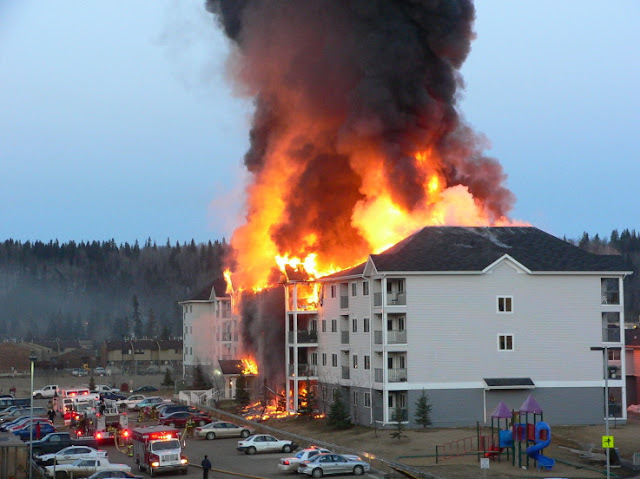 This 4 story apartment fire appears to be a total loss. Imagine the catastrophe awaiting a 6 story apartment building filled with seniors and disabled citizens. It will be a slow response time with trucks arriving from Novato and San Rafael. Grady Ranch is 4 1/2 miles from the 101 freeway. No ladder trucks can be seen in this photo. Ladder trucks cost millons to buy, maintain, house and operate. Ladder trucks and trained ladder companies are an enormous expense to the community. 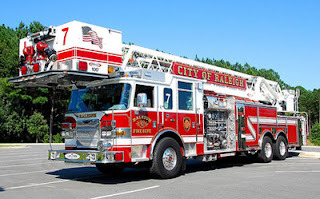 New ladder trucks over a million dollars and they require additional trained fire staff to operate safely. Marinwood Fire Department will be required to build a new fire station to house the equipment and the additional personnel. Clearly more high density housing will cost this community dearly and new taxes will be needed for this expansion. The Marinwood Village low income development will pay little taxes for their 82 units of family housing. According to Brad Wilban, Bridge Housing VP it will be approximately $142 per housing unit or $10,000 per year. Many of us pay close $10,000 for ONE HOUSE!! A financial analysis of our Firefighting readiness and a financial analysis of costs are needed before considering the current Marinwood Village high density housing plans. If you question the wisdom of having a 3-4 story apartment building in our community without the fire safety equipment and trained personnel to keep our neighbors safe. If you are upset that you will need to pay additional taxes to subsidize the Marinwood Village "big box" apartments, please join "Save Marinwood" to urge sensible growth and wise land use. Our County Supervisors must hear us. Will residents living on the third floor of Marinwood Village be safe if the closest ladder trucks are miles away in other communities? How about the remote Grady Ranch with six stories?